It’s important to remember however, big headlines aside, this is a virus you can pick up anywhere at all – at home or when you travel – and anywhere in the world. Norovirus is actually a related group of viruses and infection affects the stomach and intestines causing gastroenteritis. Anyone infected with norovirus can become very ill, very quickly, and that person will often experience stomach cramping, nausea, vomiting, and diarrhea for several days, risking dehydration from mild to severe. The Centers for Disease Control and Prevention (CDC) estimates that over 20 million cases of acute gastroenteritis occur as a result of noroviruses alone. 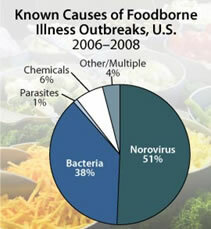 In fact, they have a rather startling chart demonstrating the fact that over half of all foodborne illness outbreaks in the U.S. were causes by noroviruses. One of the features of norovirus is that it spreads very quickly between people. People infected with norovirus are contagious immediately and for at least three days after they recover, so even those who are feeling better and are back at work (like in busy restaurants or cafes, for example) can continue the spread of the virus. Practice proper careful hand hygiene – wash your hands thoroughly with soap and water, especially after using the toilet or touching surfaces that could be contaminated and always before eating or preparing food. Take careful care to wash fruits and vegetables and cook your foods thoroughly before consuming them. Regularly clean and disinfect contaminated surfaces where someone is infected. This includes door handles, faucet handles and sinks, and toilet flush handles. Wash laundry that is worn by someone who is infected or may be contaminated thoroughly in soap and hot water. If you are sick, do not prepare food for others. Anyone experiencing the symptoms of norovirus should refrain from touching or preparing food for others while they have symptoms and for at least three days after. But again any food that is served raw or handled by a person before being cooked or during preparation has the potential to be contaminated – think salads, fruit garnishes, oysters on the half shell, etc. There is no vaccine for norovirus and no formal treatment either. It cannot be treated with antibiotics because it is a viral, not bacterial, infection. Essentially, you have to treat the symptoms and wait it out (unfortunately). That means drinking enough fluids to replace what you’re losing from vomiting and diarrhea. It also means avoiding others until you have been well for at least three days.